In all things our institute is about Growth and Creative Fruition. We are continually amazed how our core knowledge in teamwork, applied imagination, story arts, and the proprietary Quantum Leap Mechanics™ model can be applied to a vast spectrum of domains. We have used this program with visiting groups of leaders, students, artists, high performance teams, parents, and we've taken it on the road with multi-media special presentations where Marshall Monroe gives workshops as a guest speaker. Monroe has briefed at the highest levels of industry, government, NGOs, and national Security. He has lectured in the arts, sciences, and entertainment sectors. His topics include Creative Excellence, new story sciences, Global Power dynamics, transformation, and business trends. Marshall Monroe MAGIC has for many years operated a specialized internship program helping high school students build confidence and insight that has seen them go on to Harvard, Stanford, and many other college programs where they flourish having gained true insight into creative project realities. This program is invitation only and also includes college students as part of the M3 Incubator where they gain real-world venture experience. Interns are given direct counsel and skills development training, along with building their portfolios. Inquire for expense, housing, and curriculum fees. Would you like to explore the power of deep creative agility and mastery? Let us know - we're always up for a new challenge..
Marshall Monroe helped lead the creation of multiple Artist Development programs at the Walt Disney Company, and he has given workshops to dozens of technical and industry audiences. These audiences have included the Stanford University Presidential Lectures Series, NASA's Aerospace Enterprise group, numerous TED events, and economic development conferences . In his talks, Monroe introduces his "Diamond Mine" model for Creative Development and Visioning. This model helps individuals, leaders, teams, and entire organizations gain a deeper, actionable appreciation for what Magic is made of. The facets of the diamond serve as the analogs to the dimensions of design that can drive success - or rapid failure. And it is this Imagineering "Literacy" that makes the difference. Marshall Monroe is active and has been active on numerous advisory boards and commissions. These roles often take strategic form for driving large scale mission transformation and renewal. As chairman of the New Mexico governor's council on Film and Media Industries, Monroe led the creation of an Economic Development Strategic Plan that has resulted in multiple billions of dollars increase in Economic Impact. Monroe is also active as an expert testifying witness in technology based intellectual property litigation. 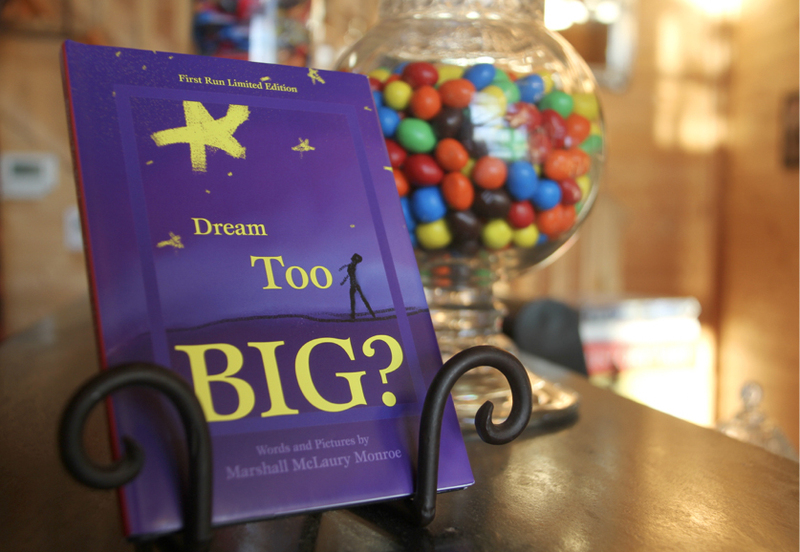 Monroe's Book Dream Too BIG? establishes the premise of all our creative work. In it, a dreamer questions their own ideas and imagination, wondering if their ideas are too large. In the course of investigation, the dreamer compares the size of their dream to the size of progressively larger features of planet earth, our solar system, and the blizzard of galaxies that fill the skies when we take long enough to look up. The book was inspired by Monroe's work with NASA and the International Space Station project, when that project was in early stages of development, and images from the Hubbell telescope were first coming in. The book and cover image were licensed by NASA for promotion of the ISS project worldwide. These books are available for group purchase for gifting and signing at Marshall Monroe speaking events. At MCi, we are looking at the new and emerging world of commerce, influence, and competition, as technology and modern communications systems change the landscape of information propagation. This research is not just grounded in the complex reality of what is today, but is also focusing on what we envision as the optimal outcome of a collection of good choices going forward. We begin with a comprehensive assessment of activities not just inside the U.S., but also inside entities like the EU, our neighbors to the North and South, and China. These activities take place in the entertainment, digital technologies, propaganda, and real estate sectors. Through this assessment, we are redefining what it means to manage, and defend, “culture” at a macro scale. This thinking has resulted in a new briefing entitled, “Future Tools, 2020,” which look at how economic development, strategic economies, and values systems must work in concert to result in a better world. Having spent three decades in the technology and storytelling industries, Monroe is a recognized authority on the topic of Media Literacy. Monroe's new speaking topic is a must-see for anyone charting a course for themselves or their enterprise in today's media-deep environment. Imaginative design, storytelling, technology & culture can all be explored in the creation of MAGIC. We continually expand our horizons as we design systems for international and global audiences. Marshall Monroe has given talks on Storytelling, Leadership, Innovation Management, and Creativity to many international audiences. Our headquarters in New Mexico is purposfully selected as a location to gain cultural inspiration. In New Mexico we see the constant mutual enrichment from Anglo, Hispanic, and Native American cultures. This interaction gives us insight as we design systems and content that find application in North America, the Middle East, Asia, and around the globe.